Not often am I speechless. Don’t get me wrong, over the years I have learned to hold my tongue when my older brother pokes fun at me in front of his good-looking friends and have discovered the beauty of a text that can be sent in one single message (pre-iPhone, of course), but communicating my emotions- both good and bad- has never been an issue for me. Then a funny thing happened on Saturday night, January 12, 2013. 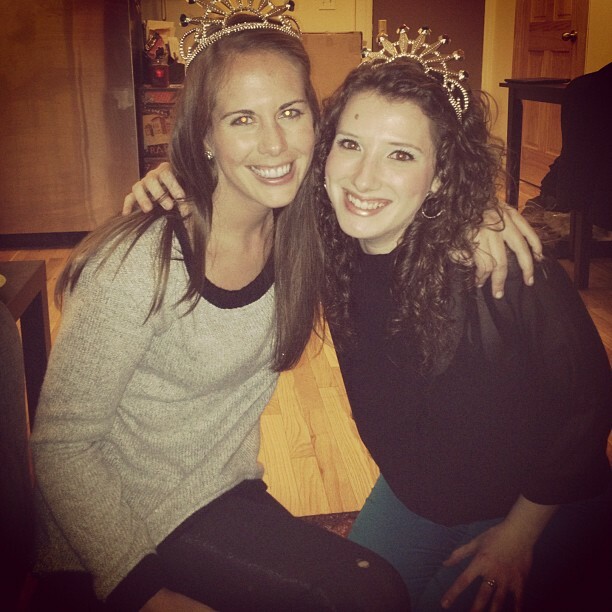 I was sitting in an apartment in Harlem with six strangers and one friend while watching the Miss America Pageant. These seven people were college friends with Laura Kaeppeler (Miss America 2012) and wanted to watch Laura pass on her title to this year’s winner. I had met Aileen, the one of the seven that I knew, during a master class with casting director Bob Cline last November. Never one to have shame in inviting myself places, I asked Aileen if I could join her “Miss America viewing party” since my plans had fallen through. So, here I was, surrounded by mostly strangers, rooting on Mallory, Miss New York 2012 (one of my very close friends) and chowing down on a lot of baked brie. Mal and I met through the Miss America Organization- originally while singing…erm rapping…karaoke with a few mutual pageant friends in the fall of 2011. We then competed together in our local and eventually at Miss New York. Spoiler alert: she won. Anyways, since her reign as Miss New York, Mallory and I have continued to build our friendship. She was even the first person I saw in New York after my mom’s passing, when she gave me a build-a-bear from all of the Miss New York girls, as well as a Fresh Direct gift card for groceries (because, as we know, nothing cheers up a pageant girl like food). Being that she’s such a gem, I was sitting on that couch in Harlem absolutely jumping out of my skin each time Mallory advanced in the competition. By the time she was standing as one of the final two, holding Miss South Carolina’s hands, I was curled up in a little ball on the couch, my knees tucked to my face (wheat thin crumbs on my lips and plastic tiara on my head) with six people who didn’t know me eyeing me as I prepared to explode. Miss America 2013 is…..MISS NEW YORK, MALLORY HAGAN!!! And then it happened. My words were gone. I couldn’t say “She did it! !” No, I could not even muster an “Oh my gosh! !” Instead, what can only be described as a banshee scream came pouring out of my mouth. Honestly, it sounded as though I had just witnessed murder. My voice teacher would have had a fit on account of my vocal chords as this terrible noise erupted from my throat for what must have been at least 15 full seconds. Eventually I stopped screaming when I realized that the neighbors of this stranger’s apartment might call the police. Still, no words came for at least a few minutes as I made smaller, shorter shrieks while Mallory walked down the runway as Miss America. Never once in that moment of mental collapse which resulted in my discovery that I have the chops to possibly star in the next exorcist movie did I think, “Oh cool! Now I’ll be Miss New York!” I was not even in the Top 5 in the Miss New York Pageant. As a matter of fact, I’ve been very open about the fact that due to my mom’s illness, I was so unfocused at last year’s pageant that I was shocked to find myself in the Top 10. Consequently, when a couple of people this past week exclaimed, “Shannon! Maybe you’ll take Mallory’s title!”, I looked at them as though they had just suggested that in a week from now I’d be on the moon. Crazy-talk. In my last year of eligibility in the MAO, I moved from Virginia to New York. My mom was diagnosed with cancer seven days before my local. Three months later, I made Top 10 in Miss New York (the last time my mom ever saw me on stage). Two and a half months later, she passed away, one of the last things she said to me being how glad she was that I did Miss New York because it gave her a chance to spend time with the whole family and to see me sing. Four months later, Mallory wins Miss America (the first Miss NY in nearly 30 years to do so) and all of the girls who placed above me pass on the title until finally, on a crowded bus, I receive an email asking me to become the new Miss New York. How can I not believe that my mom went to heaven and pulled a couple strings to make my dream come true during what has been the hardest time of my life? This minor miracle of becoming Miss New York is precious proof that she is still with me, still my biggest fan. I know she would be jumping up and down, washing away all of my nerves about accepting this title (do I even look like Miss New York?? Last year’s Miss New York, Kaitlin Monte, was recognized by Governor Cuomo for her work against bullying…who am I?? ), and motivating me to go out there and just give these next six months my all. Who cares that I had put my pageant days far behind me? I am no less capable now than I was when I was eating chicken and broccoli, size 2, and preparing for the pageant seven months ago. All I have to do is shift my mindset and prepare for what is to come! I like knowing that she’d say those things, because I cling to them fervently as I begin this new adventure. Now that I’ve written a short novel, I would like to wrap up by saying THANK YOU to everyone who has reacted with such support and excitement. I’ve said it on this blog before, and I’ll say it again, I don’t want to be anyone but me. The friends and family I get to call my own make me incredibly happy on a daily basis, whether I’m goofy Shannon who is trying to make it on Broadway along with five million other people, or I’m the reigning Miss New York. So much has happened in one short year, but with the highs and the lows, I think I’m pretty darn lucky feel so loved through it all. One last thing: AHHHHH!!!!!!! I’M MISS NEW YORK!!!!! Money is Nice. Generosity is Better. 1 Comment on "Speechless: Miss New York 2012"